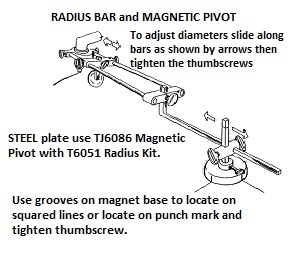 The TJ6086 Magnetic Pivot is included with each Guide Kit and is also available separately. The pivot assembly suits use with all Circle Guides by fitting directly to the Guide Frame, or it can be used with the TJ6051 Radius Bar for larger diameters. This combination can also be used with the Tanjant Roller Guide, with some limitations. The Magnetic Pivot is for use on clean, dry steel only. Not be used for cutting circles less than 150mm (6″) diameter as casing/bonding material may be damaged. Tanjant Tool Co. Pty. Ltd.
© 2019 Tanjant. All Rights Reserved.